This ancient English and Scottish surname was rarely recorded and never as a surname, before the Norman Invasion of 1066. Its popularity dates from the 12th century when returning Crusaders from the Holy Land gave it to one of their sons in commemoration of the fathers expedition. The derivation is from the Hebrew male given name "Mattathiah" meaning "gift of the Lord". It is first recorded in the Domesday Book of 1086 in the Latin form 'Matthaeus' and in the French spelling 'Mathieu', but neither of these recordings are surnames, but names of priests. 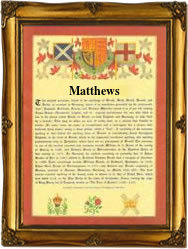 The surname is first recorded in the mid 13th Century and early examples include John Mathows of Whitby in Yorkshire in 1395 and Hugh Mathewman in the 1379 Poll Tax rolls, also of Yorkshire. The final "s" where appropriate, is a reduced form of "son of", although curiously the full patronymic is not recorded until the early 15th Century when John Matheuson appears in the register of the Freemen of York in the year 1416. Captain Samuell Matthews was one of the earliest settlers in the New World. He is listed as 'living at the plantation by James Cittie' (Virginia), in February 1623, whilst Christopher Mathews was recorded as marrying Ellyn Smith on the 18th May 1642, at St. Benet's, Paul's Wharf, London. The first recorded spelling of the family name is shown to be that of Alan Mathew, which was dated 1260, in the Assize Rolls of Cambridge, during the reign of King Henry 111, known as 'The Frenchman', 1216 - 1272. Surnames became necessary when governments introduced personal taxation. In England this was known as Poll Tax. Throughout the centuries, surnames in every country have continued to "develop" often leading to astonishing variants of the original spelling.